Wind Turbine Control System. Vauxhall Tower, London. 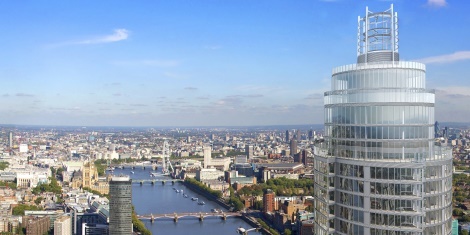 The Vauxhall Tower is the tallest residential tower in London and is part of the St. George Wharf development completed 2013. IAC provided the design, supply and commissioning for the PLC control system for the wind turbine project. The turbine is located on the roof and is virtually vibration free. The power generated will provide a carbon neutral addition to the buildings power consumption. The control system is located in a control room on the 49th floor of the 52 floor apartment building. The control system controls everything including braking, vane speed, vane angle and weather monitoring to ensure safe working. The system is based on an ABB AC800M PLC. The control panel includes a door mounted 10.4” colour ABB HMI with a number of operator screens for monitoring, control and trending along with an alarms page. The system also included a Pilz safety relay with Estop functionality. The integrity of the system was upheld with a cabinet mounted UPS that would allow the system to be controlled to a safe stop given a power interruption.